A weekly newspaper photographer’s dog has been touted as a possible psychic after correctly predicting six out of six World Cup results. Tilly the springer and cocker spaniel cross, who belongs to Newbury Weekly News photographer Phil Cannings, has been hailed as a “wonderdog” after she predicted England would beat Colombia on Tuesday evening. Seven-month old Tilly’s other previous correct predictions include Russia beating Saudi Arabia, England beating Tunisia, France beating Australia and Iran beating Morocco. 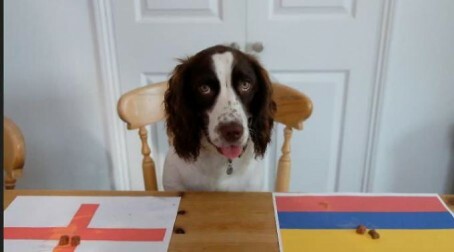 To make her predictions, Tilly has been called on to choose dog treats placed on the flags of the participating countries. She also managed to correctly predict that Brazil and Switzerland would draw, after a feline intruder intervened before she could make her decision, as seen in the below video. Said Phil: “As the build up to the World Cup hit fever point in the newsroom, the chat turned to remembering famous psychic animals and if we could find one in our area. “So Tilly, my seven-month-old Sprocker stepped forward to give it a go. “From a young age she always loved playing with a football so I knew this would be perfect for her. Earlier this year, HTFP reported how Cambridge News crime reporter Raymond Brown’s pet tortoise Jack had correctly identified Cambridge as the winner of the University Boat Races in a similar game. no it hasn’t – is HTFP looking for click bait now?